Well, of course, all of these people can't be me...just the old guy on the back right. 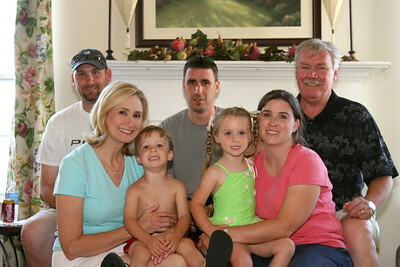 The rest are my sons, David (center) and Jason (left rear)and (front row) wife Debbie, Grandchildren Reece and Reagan and daughter-in-law Crystal. You can see that Reece and Reagan don't spend much time in front of the camera (yeah right). This photo was taken on May 30, 2006, Reece and Reagan's 4th birthday!